Home • Pet Blog • Pet 411: Do Pets Grieve When Another Pet Dies? I received an email from a reader that I thought raised an interesting question. Her 9-year-old dog recently died in her sleep. The death was particularly upsetting because the dog seemed to be in good health. The reader’s question was, does her surviving dog feel the loss the same way she does? For help, I turned to one of my colleagues, Dr. Jill Sackman, who specializes in behavioral health and is a medical director for our Michigan hospitals. 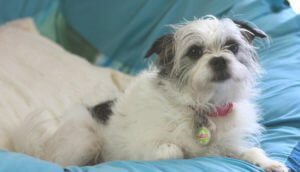 Dr. Sackman says there is certainly evidence that dogs form relationships with other pets living in the same household. And in many cases they will miss having someone to do things with, whether that’s napping together or playing or taking walks. That’s especially true if the dogs have really bonded with one another. Dogs are also very perceptive of their owner’s moods and behavior. So if you are feeling sadness or grief, your dog may be picking up on your behavior changes and acting differently as a result. “Dogs are really good at picking up on when we’re not feeling well,” Dr. Sackman says. The effects aren’t always negative. In some cases, the loss of a pet can create a stronger relationship between the owner and the surviving pet, Dr. Sackman adds. But do dogs feel actual sadness, the same way we do? Dr. Sackman says research has shown that animals can show signs of depression, including loss of appetite and lack of engagement. While they may not understand the other pet is dead, they will feel the loss of their playmate and companion. If your dog is showing any signs of depression, Dr. Sackman recommends trying to step in and fill some of the gaps left by the loss of your pet. For example, try to spend more time with your dog. Take walks together and schedule extra playtime. Interesting food can be used to enhance play or to teach tricks and may help snap your dog out of a funk. One thing Dr. Sackman cautions against is immediately trying to replace a pet. “That relationship was very special,” she added. 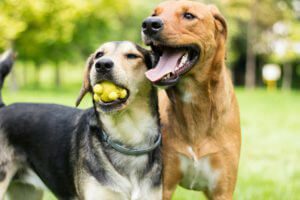 When the time is right to introduce another dog into the household, Dr. Sackman says there are many different factors to consider – particularly your dog’s age. “A puppy that is really active tends to be annoying to an older dog,” she said. Dr. Sackman also notes that dogs of different genders tend to get along better, and be sure they share a similar level of activity. “Sometimes you don’t really know if they’re going to get along until you try it out,” she says. Thank you so much for your help, Dr. Sackman. And to our reader, we’re so sorry for your loss. We hope you and your dog are doing well.